Comments-This is a great duck hunting property with abundant deer hunting also. 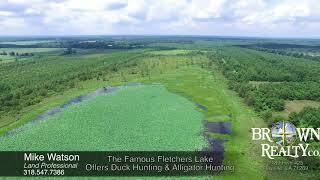 The tract is in WRP and consists of nearly 50 acres of shallow water area which does not include Fletchers Lake. This area has always been known for great duck hunting. The property is priced to sell. If you are a duck hunter you owe it to yourself to take a look at the piece. Two camp sites are part of this along with a boat ramp. An additional 7 acres could possibly be bought separately on the southeastern portion of the property. It is farmland and offers a very nice home spot on the lake. Ten gator tags can be had also and the fishing is a plus.